Some people don’t know what an espresso is. Some might think it is just another word used to describe a cup of coffee. But, unlike joe or java, espresso is not just another synonym for coffee. An espresso is a strong black coffee made from steam. The name espresso is Italian for pressed out coffee. While an espresso is a type of beverage made from coffee beans, it is completely different than what most people consider to be regular coffee. The difference between a regular cup of coffee and an espresso comes from the different brewing processes. Regular drip coffee is made by pouring water over coarsely ground, roasted beans that are placed in a filter. The filter catches the grounds, which are later discarded. The purified liquid is what we know as coffee, and what we drink. Espressos are made by forcing a small amount of steam or almost boiling water through finely ground beans. In an espresso, there is no filter, so the natural oils of the beans are processed into the drink. This makes an espresso much thicker than a regular cup of coffee. An espresso is also smaller than a regular cup, normally around 1 ounce, while drip coffee is generally served in an eight-ounce cup. Additionally, espressos have a much higher caffeine content than regular drip coffee. Since there is no filter used for an espresso, the natural oils give an espresso a much different flavor. First off, an espresso has a very thick consistency compared to a cup of regular drip coffee. It should feel something like melted butter in your mouth; very thick, and smooth and oily, in a positive way. The taste should be similar to that of regular coffee, but much thicker. There should be no hint of burnt or chemical taste. Depending on the beans, the flavor can be flowery, earthy, spicy, or fruity. In general, it should be deep, rich, and complicated, and should leave an aftertaste for about 10 or so minutes. When you translate latte to English, it literally means milk. So it should come to no surprise that milk is going to be one of the main ingredients in a latte. The latte is a very popular drink that is made from a shot of espresso, and it also fairly simple to make. It only has three parts to it: a single shot of espresso, 10 ounces of steamed milk, and then one ounce of foamed milk. A mocha is another very popular espresso drink. 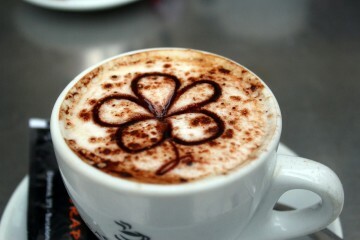 A mocha is also very similar to the latte, but it is going to be much sweeter. The magical ingredient in a mocha: chocolate. That, along with the milk, is going to give the drink a very rich and velvety taste. To make an mocha, you need a shot of espresso, some chocolate, and an ounce of steamed milk. A macchiato is an espresso drink that, when translated literally, means stained or spotted coffee, meaning the coffee is tainted with milk. The macchiato is made with a shot of espresso (or two if you are feeling brave) and a dollop of foamed milk. It can be prepared with either steamed hot or cold milk, depending on personal taste. Sometimes a macchiato is served with regular milk instead of steamed, and it can also come in an assortment of sweet flavors. The most popular flavor addition is caramel. The cappuccino might be the most popular form of espresso. It is an Italian form of espresso that is generally prepared with equal parts espresso, steamed milk, and foamed milk. Creamer can be substituted for the milk if wanted. It is typically served in a smaller volume cup than a latte, with a thicker layer of foam. It can also be topped with cinnamon. An americano is a espresso drink that is prepared by brewing a shot of espresso, and then diluting it with twice the amount of water. The strength of the americano depends on the number of shots of espresso, and then the amount of water added. It is thought that the americano was created during World War II when American soldiers were stationed in Italy and Europe, and couldn’t stand the strong flavor of European coffee, so it was diluted down to where they could drink it.